But, like all drivers, Elliott, 22, is greedy. Greedy for victories. 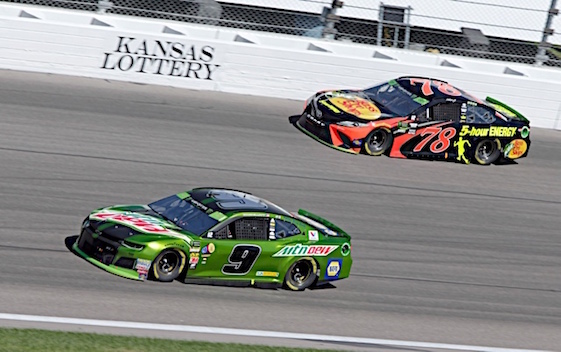 The Hendrick Motorsports driver used that greed to win at Kansas and build big momentum. The victory was Elliott’s third of the season and came in a race in which he led 44 of 267 laps. Kyle Busch of Joe Gibbs Racing finished second while Kyle Larson of Chip Ganassi Racing was third. Larson made a late charge in a race which he needed to win in order to advance. Sunday’s was the cutoff race for drivers hoping to advance from the Round of 12 to the Round of 8 in the playoffs. Falling out of the playoffs as a result of events at Kansas were Alex Bowman, Larson, Ryan Blaney and former champions Brad Keselowski. Advancing Sunday were Busch, Joey Logano, Kevin Harvick, Kurt Busch, Clint Bowyer and Martin Truex Jr. They joined Elliott and Aric Almirola who earned automatic berths by virtue of winning the previous two Round of 12 races. The three-race Round of 8 begins next weekend at the Martinsville Speedway short track. Joey Logano started from the pole, won the first stage and led 100 laps. Logano cruised until green flag pit stop at about the half way point of the 267-lap race. When the pitting cycled through, Harvick was out front and stayed there to win Stage 2. Harvick led until the final green flag stop of the day with just over 50 laps to go. During his stop, he was penalized for speeding and hopes for getting his first victory of the playoffs ended. When pitting finally cycled through with just over 40 laps to go, Elliott had the lead. It was a lead he never surrendered. Larson made a late charge in a race he needed to win in order to advance. Asked if he thought he had a chance at catching and passing Elliott on the final laps, Larson said, “Yes I did. (13) Chase Elliott (P), Chevrolet, 267. (7) Kyle Busch (P), Toyota, 267. (27) Kyle Larson (P), Chevrolet, 267. (6) Erik Jones, Toyota, 267. (12) Martin Truex Jr. (P), Toyota, 267. (5) Brad Keselowski (P), Ford, 267. (4) Ryan Blaney (P), Ford, 267. (1) Joey Logano (P), Ford, 267. (10) Alex Bowman (P), Chevrolet, 267. (3) Aric Almirola (P), Ford, 267. (23) Austin Dillon, Chevrolet, 267. (2) Kevin Harvick (P), Ford, 267. (14) Clint Bowyer (P), Ford, 267. (9) Denny Hamlin, Toyota, 266. (16) Ryan Newman, Chevrolet, 266. (21) Chris Buescher, Chevrolet, 266. (20) Jamie McMurray, Chevrolet, 266. (11) Kurt Busch (P), Ford, 266. (28) David Ragan, Ford, 265. (15) Ricky Stenhouse Jr., Ford, 265. (25) AJ Allmendinger, Chevrolet, 265. (22) Jimmie Johnson, Chevrolet, 264. (31) Matt DiBenedetto, Ford, 264. (8) Daniel Suarez, Toyota, 263. (30) Ty Dillon, Chevrolet, 263. (29) Bubba Wallace #, Chevrolet, 263. (24) Michael McDowell, Ford, 262. (26) Regan Smith, Chevrolet, 259. (35) Landon Cassill(i), Chevrolet, 258. (19) Trevor Bayne, Ford, 258. (36) JJ Yeley(i), Toyota, 256. (18) Paul Menard, Ford, 256. (38) BJ McLeod(i), Chevrolet, 250. (34) Corey LaJoie, Chevrolet, 219. (37) Kyle Weatherman, Chevrolet, Transmission, 216. (39) Reed Sorenson, Chevrolet, Vibration, 157. (33) Jeffrey Earnhardt, Toyota, Transmission, 151. (17) William Byron #, Chevrolet, Engine, 55. (32) Ross Chastain(i), Chevrolet, Accident, 37. (40) Timmy Hill(i), Toyota, Engine, 3. Average Speed of Race Winner: 152.713 mph. Time of Race: 2 Hrs, 38 Mins, 2 Secs. Margin of Victory: 0.903 Seconds. Lead Changes: 11 among 8 drivers. Lap Leaders: J. Logano (P) 1-40;A. Allmendinger 41-49;B. Wallace # 50-51;J. Logano (P) 52-62;R. Stenhouse Jr. 63;R. Blaney (P) 64-71;J. Logano (P) 72-120;R. Blaney (P) 121;B. Keselowski (P) 122-137;K. Harvick (P) 138-213;B. Keselowski (P) 214-223;C. Elliott (P) 224-267. Leaders Summary (Driver, Times Lead, Laps Led): Joey Logano (P) 3 times for 100 laps; Kevin Harvick (P) 1 time for 76 laps; Chase Elliott (P) 1 time for 44 laps; Brad Keselowski (P) 2 times for 26 laps; AJ Allmendinger 1 time for 9 laps; Ryan Blaney (P) 2 times for 9 laps; Bubba Wallace # 1 time for 2 laps; Ricky Stenhouse Jr. 1 time for 1 lap.